When I find a duck breast in my fridge I always use this menu. The recipe is from the website here.To get the best result cooking duck breast I always make sure I cook my duck breast perfectly and have enough time to rest it. One of my favourite TV shows, Masterchef, told me that. The recipe might serve duck breast a different way than me. I usually serve with rice as I am a big fan of rice:-) Then I place steamed bok choy along side the duck and rice. That is enough to make your meal look like it came out from the good restaurant. re-heat oven to 360 ° F (180 ° C). Square off the edges of each strip using a sharp knife and then slice each strip into very thin julienne. Place the julienne pieces into a shallow pan of cold water, bring to the boil and blanche for two minutes (this will soften any bitter taste remaining in the orange peel). Now section the orange pieces: with the remaining orange pulp, slice off the very top and bottom of the orange. Using a sharp paring knife, remove each individual orange section, cutting in-between each membrane. Place the orange slices in a bowl and cover with a bit of orange juice to keep moist while you prepare the rest of the dish. Now prepare the orange sauce: place sugar and red wine vinegar together in a saucepan and whisk over medium high heat for several minutes until the mixture turns a deep reddish-brown color. Add the orange juice and chicken stock and whisk over medium heat until the sauce reduces to about 2/3 of the orginal volume- this will take about 5 -6 minutes. Remove the pan from the heat and set aside. Prepare the duck breasts: trim the fat around the edges of each breast and score the top of each breast (the white fat part) using a sharp knife. Your knife should only slice through the fat and not puncture into the duck meat. Season both sides of each breast with salt and pepper. Cook the meat: Add a small amount of oil to a fry pan and place over a high heat. Sear the scored fat side of each duck breast first for about three minutes until golden brown and crispy. Turn the breast over and cook for about four minutes over medium heat. Remove each breast from the pan and make a small incision on the bottom, about an inch deep- this helps to cook the inside of the breast more easily. Now wrap each breast in foil and place in the oven for 4 – 5 minutes, until the inside is cooked until pink in color. If the inside is still red, continue cooking for another few minutes. Remove from the oven and let the meat rest covered in foil for 10 – 15 minute. Drain the fat from the fry pan; over medium heat, add some water or stock to the pan and use a spatula to scrape the brown ‘cooked bits’ off the bottom of the pan. Stir and then add this liquid to the Orange Sauce (continued from step # 6). To finish the Orange Sauce, add the Cointreau or Grand Marnier that was used to soak the orange julienne slices. Continue to whisk the sauce over medium heat until it reduces further. Combine the white cornflour and port together to make a paste and then add to the Orange Sauce to help thicken it further. The sauce should be rather thick in consistancy, but not heavy like molasses. 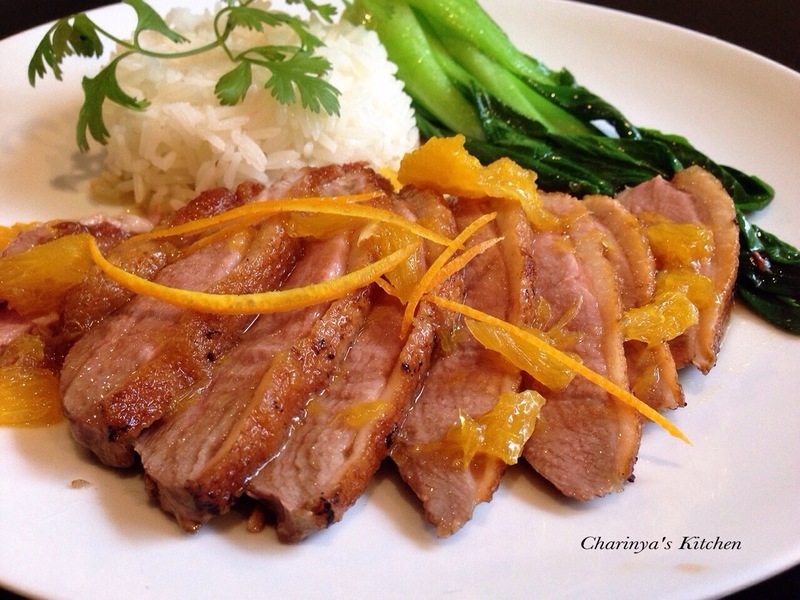 To plate the dish, slice the duck breast horizontally into thin slices, pour some sauce over the top of the meat, place a little of the orange julienne slices on top of the meat and arrange a few orange slices around the side.